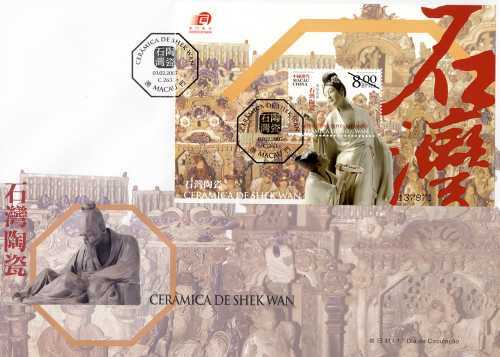 Macao Post and China Post Group Corporation will jointly issue the stamp theme “Shek Wan Ceramics” on 3rd February, 2007. 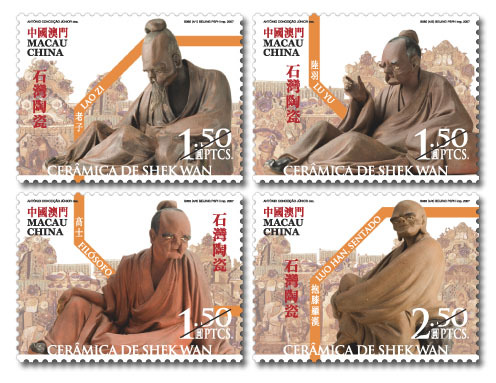 With the great support from the Macao Museum of Art, an uncommon set of four miniatures created by Master Pan Yu Shu is selected for the Macao stamp design, which is a sample of other much larger pieces, the ceramic figurines on the four stamps are Lao Zi, Lu Yu, The Scholar and The Seated Luo Han. 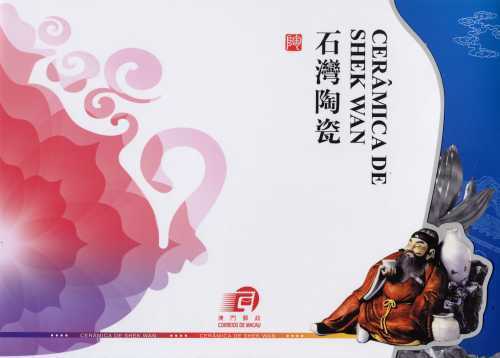 The souvenir sheet is applied with the varnish printing technique to enhance the elegant pose of the ceramic work “The Concubine After Bathing”. 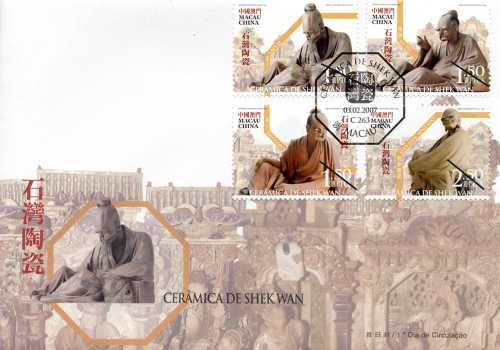 The stamp designs richly demonstrate the unique style of Shek Wan ceramics with long history of tradition, by unglazing the skin on the ceramic figurines. Contains a stamp sheetlet of 2 sets of 8 stamps in total, with 3 stamps at MOP1.50 and a stamp at MOP2.50, total valued at MOP14.00. 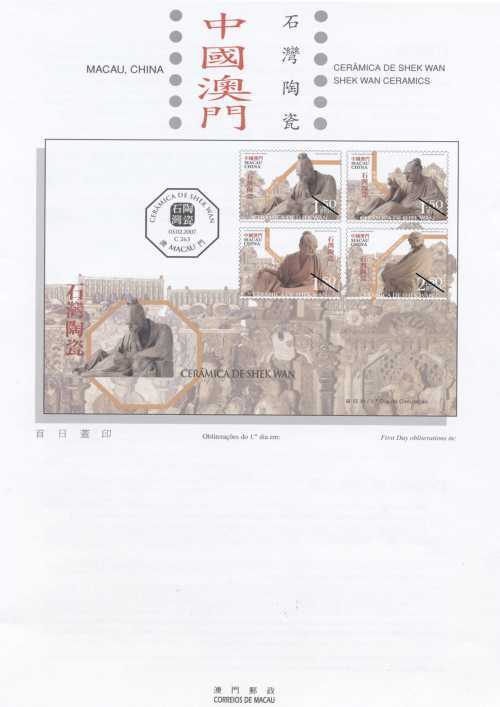 China Post Group Corporation:v Contains a stamp sheetlet of 4 sets of 8 stamps in total, with 2 stamps at RMB1.20 each, total valued at RMB9.60. The stamp designer and the author for the information brochure for this issue is Mr. António Conceição Júnior. This is the second issue in 2007. 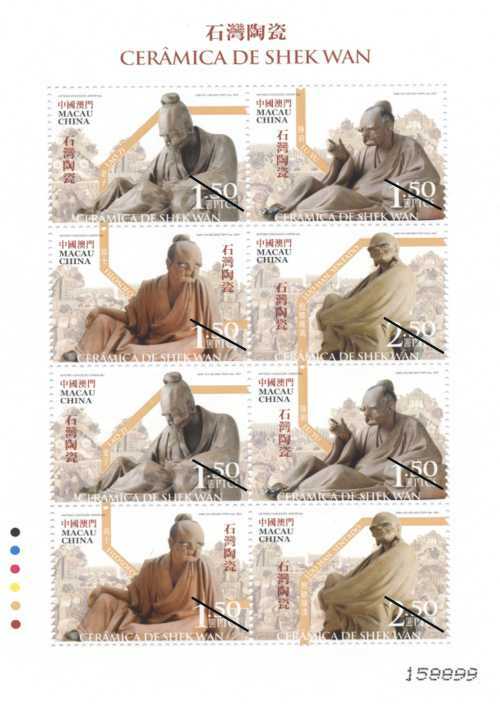 The issued stamp is as “Lunar Year of the Pig” on 08/01/2007. To celebrate the 123rd Anniversary, Macao Post announced that a Temporary Post Counter will be set up at our Philately Shop located at Macao Post Headquarters and the Communications Museum on 1st March 2007 providing the commemorative cancellation service for the “123rd Anniversary of Macao Post”. To celebrate the 1st Anniversary of Communications Museum, Macao Post announced that a Temporary Post Counter will be set up at our Philately Shop located at Macao Post Headquarters and the Communications Museum on 1st March 2007 providing the commemorative cancellation service for the “1st Anniversary of Communications Museum”. 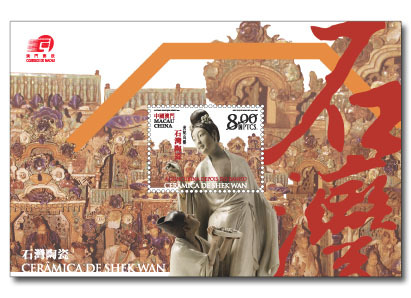 In order to enhance the promotion of Macao Stamp and to provide a better service, Macao Post has installed a “Philatelic E-counter” at the Central Post Office. 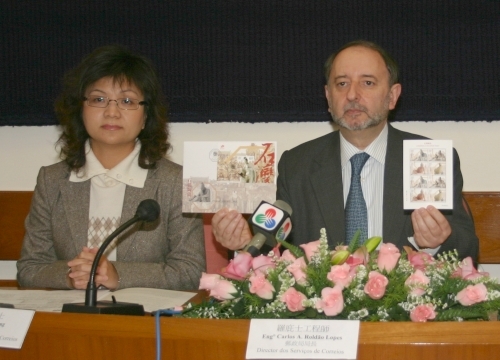 Citizens and stamp collectors can view and choose Macao philatelic products at the “Philatelic E-counter”. Then they can collect their orders at the Philatelic Shop. 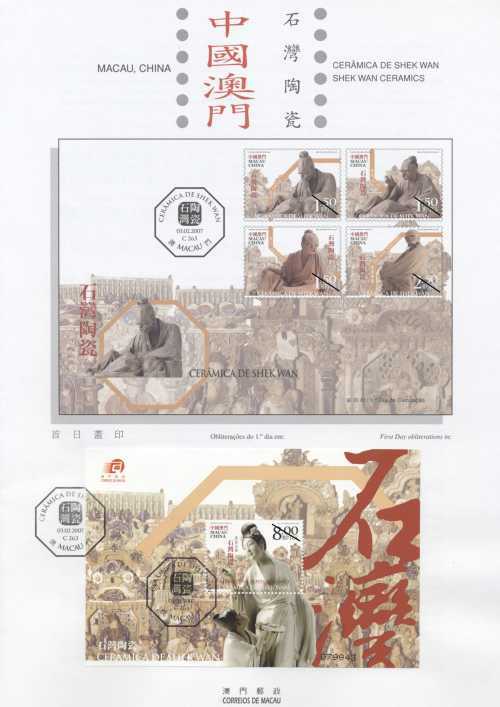 Furthermore, the users can fully enjoy the past issues of Macao stamps on screen, enriching their knowledge of Macao stamp history and understanding its development of the diverse themes and design. 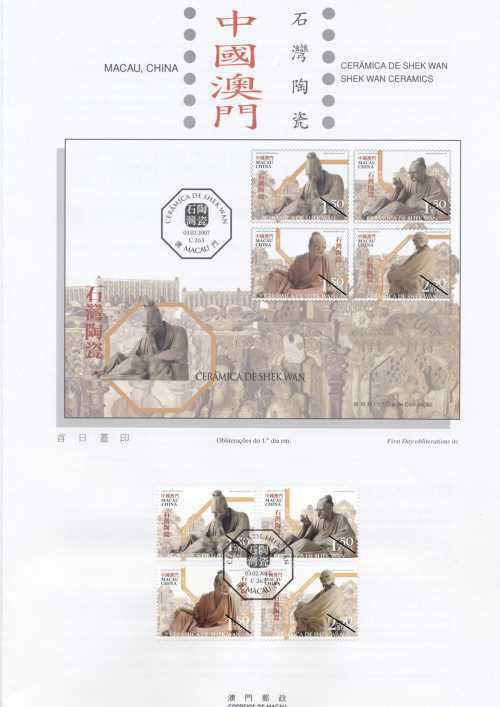 On the other hand, users can also browse the characteristic stamps of other Postal Administrations.